The GDPR fundamentally changed the data privacy landscape, but that was clearly just the beginning. ?The recently approved California Consumer Privacy Act firmly plants similar rights in the US market, and other global regulations demonstrate that we are in a new era of data privacy.? It’s time for a paradigm shift in our approach to data ownership and rights. This series is part of a special education / networking series in which TrustrArc is partnering with Intel, Microsoft, BDO, and GDPR Edge to bring to 20 locations across the US and EU. The Summits will bring together a wide range of expertise and industry perspectives from practitioners, the participating partners, and other special guests to discuss emerging trends on data privacy management. The San Francisco Bay Area Cyber Security Conference hosted by DataConnectors features 40-60 vendor exhibits and 8-12 educational speaker sessions discussing current cyber-security issues such as cloud security, email security, VoIP, LAN security, wireless security & more. We give away numerous prizes including cash and gift cards up to $100, the latest tech gadgets and much more! You’ll come away with advice and knowledge so you can start proactively protecting your environment from the latest security breaches. TrustArc is a sponsor at this event. Stop by the TrustArc table to say hello! The German Chapter of the ACM turns 50 this year. Celebrate with us! (Conference language will be English.) Under the motto “Mensch-Sein mit Algorithmen / Being Human with Algorithms” we want to discuss effects of the digital transformation to our society with you! This topic affects us all. Exciting talks around digitalization, artificial intelligence, autonomous driving, big data, blockchain, and more. TrustArc is a sponsor at this event. This webinar will review the preventative steps you can take, guidance on building an incident response plan and comprehensive tools to automate and document these processes ensuring you can meet the potential 72 hour reporting window. 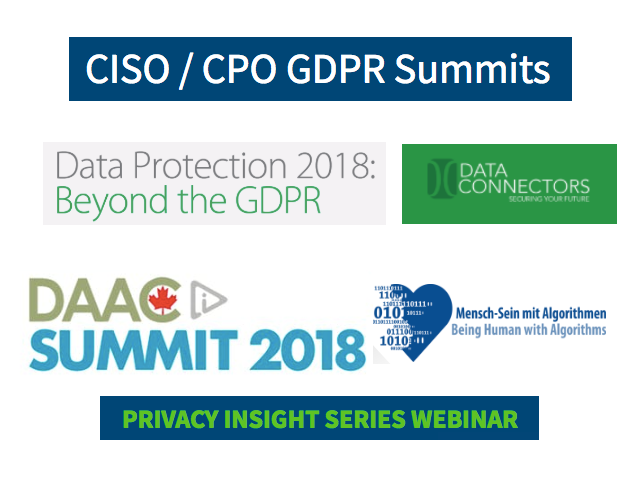 At DAAC Summit 2018, hear about recent privacy news from Canada, the US, and EU directly from representatives from the DAA, EDAA, DAAC (+more!) as well as how self-regulation can flexibly keep pace in changing privacy landscapes. TrustArc Senior Counsel Darren Abernethy will be speaking at this event. GDPR has arrived, so what now? Join the DMA, deputy commissioner at the ICO, Steve Wood, Professor of philosophy and ethics Luciano Floridi, the BBC, Homeserve, Channel 4, Trainline and more to look at the next steps in the world of data. GDPR presents businesses across the globe with the opportunity to put customers’ front and centre of a company’s culture. The new laws offer marketers the greatest chance for business transformation in a generation. So what are the next steps now GDPR has arrived? What do the policy makers have in store for marketers in 2018, 2019 and beyond? This conference will be a forum to discuss the latest goings-on in the four months since GDPR implementation, as well as offering attendees the opportunity to have their burning questions answered. TrustArc is exhibiting and hosting a round table at this event.